Missouri Democrats successfully landed their top choice to challenge first-term Republican Sen. Roy Blunt. 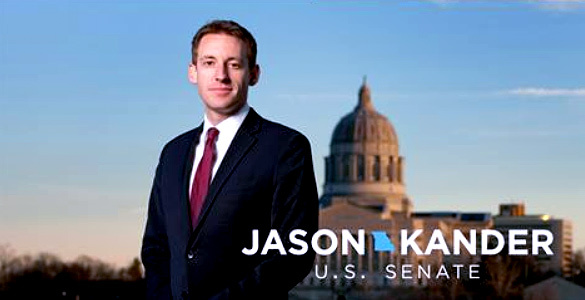 Secretary of State Jason Kander (above), an Afghanistan and Iraq War veteran, made public yesterday his plans to seek the US Senate seat next year. Kander, 33, a former two-term state Representative from the Kansas City metropolitan area, won a close 2012 race for Secretary of State – ironically, a position Blunt himself held from 1985-1993 – defeating Republican Shane Schoeller by just over 39,000 votes out of more than 2.6 million ballots cast. He will face an uphill battle against Sen. Blunt, one of the best prepared and battle tested of Republican incumbents. Winning a landslide 54-41 percent victory against then-Secretary of State Robin Carnahan (D) in 2010, Blunt is now chairman of the Senate Rules and Administration Committee in the new Republican majority. Elected to the House from the southwestern 7th Congressional District in 1996, he quickly rose to the position of Chief Deputy Majority Whip, and was elected both Majority and Minority Whip. Since the beginning of the 21st Century, Republican candidates have swept the presidential elections here, and recent Missouri political trends suggest that Kander is unlikely to receive much of a bounce from what will surely be a higher voter turnout model. Though the Show Me State has the fourth-best record in backing the winning presidential candidate in every election since 1900 (25 of 29 presidential campaigns), the state now decidedly tracks toward the GOP in national contests. Two of their four times in voting against the presidential winner came in the latest contests, 2008 and 2012. As the elections of both two-term Sen. Claire McCaskill (D) and two-term Gov. Jay Nixon (D) indicate, Missouri can still swing to either side but its days as a political bellwether have likely passed. It is probable that Democrats won’t even target the state in the 2016 presidential campaign. In preparation for the coming Senate campaign, incumbent Blunt raised $2.9 million during the 2014 election cycle and begins his re-election drive with over $2.2 million in the bank. At this point, he is unlikely to draw a significant primary challenge, which is a critical factor in strengthening his position for the general election. The Kander challenge should draw some early national attention, but that will likely fade as the election year takes hold. Sen. Blunt looks to be in a commanding position for re-election. Democrats are striving to attract strong challenger candidates against the 24 Republican senators who must defend their seats next year. Defeated Alaska Sen. Mark Begich (D) has not closed the door on challenging Sen. Lisa Murkowski (R). Rep. Kyrsten Sinema (D-AZ-9) is a potential Senate candidate against veteran incumbent and former Republican presidential nominee John McCain; and representatives Debbie Wasserman Schultz (D-FL-23), Alan Grayson (D-FL-9), and Patrick Murphy (D-FL-18) are possible candidates for the Florida seat, particularly if Sen. Marco Rubio (R) decides to vacate in order to run for president. In what may be the Republicans most vulnerable seat, that of Illinois Sen. Mark Kirk (R), Rep. Tammy Duckworth (D-IL-8) appears to be moving toward running statewide, while as many as three other House members are also mulling their own senatorial prospects. The Democratic leadership is putting the hard close on New Hampshire Gov. Maggie Hassan (D) to challenge Sen. Kelly Ayotte (R), but the state’s chief executive has yet to commit to running. Former Ohio Gov. Ted Strickland (D) is giving clear signals that he will enter the campaign to challenge first-term Sen. Rob Portman (R). Turning to Pennsylvania, the Democratic Senatorial Campaign Committee leadership appears intent on recruiting a candidate other than former Rep. Joe Sestak (D-PA-7) despite him holding Sen. Pat Toomey (R) to a 51-49 percent win in 2010. Sestak is reportedly not a favorite of party leaders in Washington or Harrisburg; hence, the desire to have a different nominee in what is always a very winnable state for a Democratic candidate. Finally, in Wisconsin, former senator Russ Feingold still tops the list of Democratic recruits against first-term Republican incumbent Ron Johnson. In 2010, Johnson unseated then-Sen. Feingold 52-47 percent. Indications suggest that Feingold will attempt to regain his previous position.